Uruguay’s marijuana regulation bill faces a number of political and economic obstacles, but if properly implemented it could provide a model for other countries dissatisfied with the dominant approach towards drug policy in the region, as well as address growing insecurity in the historically peaceful nation. It appears that the bill, which has been under consideration by Uruguay’s ruling Frente Amplio (FA) coalition for the past year, will finally face a lower house vote on July 31, and will likely pass with the full support of the FA’s slim majority in Congress. While opinion polls suggest the Uruguayan public is still largely opposed to marijuana regulation, a diverse platform of human rights groups, health workers and lawyers called “Regulacion Responsable” has launched an aggressive nationwide campaign to promote the measure, and has had success in altering the national debate on marijuana policy. Since the campaign began in May, the conservative opposition in the country (the traditionally dominant National and Colorado parties) has become somewhat split on the issue, with a handful of opposition lawmakers voicing measured support for the initiative. Although the opposition’s leadership will likely restrict these legislators from voting for the measure next Wednesday, their backing suggests that Uruguay’s political class is becoming increasingly convinced of the need to regulate the black market for cannabis in the country. So far, there has been little English-language coverage of the marijuana bill’s specifics or its potential impact on Uruguayan society. Most of the mainstream media has focused on its unpopularity, or on President Jose Mujica’s first proposal to legalize marijuana last June. The initiative has actually changed significantly since being introduced to Congress last year, and no longer involves the state monopoly Mujica first suggested. At the risk of self-promoting, perhaps the best available breakdown of the current bill is in this two-part investigation I wrote for InSight Crime, which has just been published. 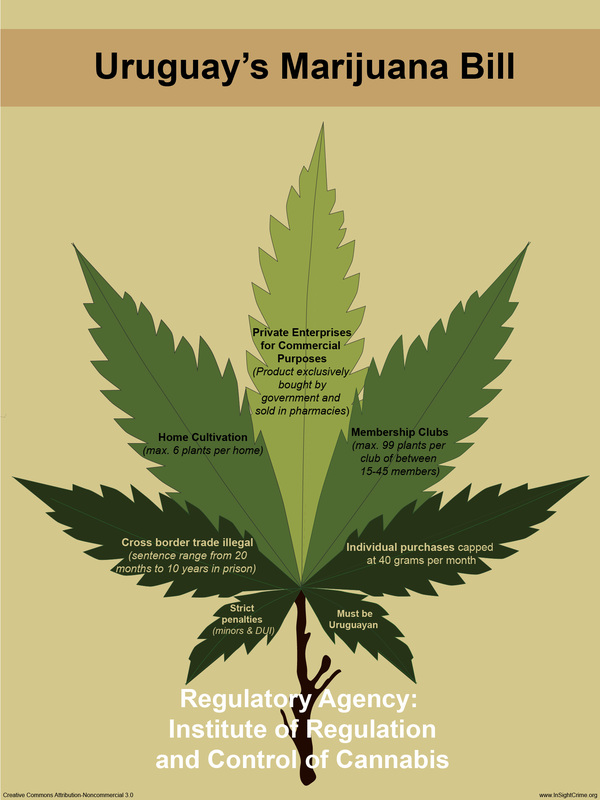 As illustrated in this helpful graphic, in its current version the bill authorizes three forms of marijuana cultivation, which will be monitored by a new regulatory agency. The first of these is domestic cultivation, or “autocultivo,” in which adults can grow up to six plants in their homes, with a maximum annual yield of 480 grams. The second involves so-called "membership clubs," which allow cannabis enthusiasts to form growing cooperatives of between 15 and 45 members, and grow up to 99 plants. Third, the bill authorizes the state to grant licenses for private enterprises to grow marijuana for commercial purposes. This harvest will only be sold in pharmacies, though it will be available without a medical prescription. To purchase cannabis, users will have to present identification, and will sign on to a secure federal registry. The bill’s success at undercutting the black market for marijuana (some 80 percent of which is imported from Paraguay, according to analysts) will depend on a number of economic and political factors. Although it will be kept private, users in Uruguay are already forced into a vulnerable position by being made to sign on to a federal registry. If politicians succumb to pressure from the opposition to levy taxes or alter the availability or price of the drug, it may not be enough to shut down the illegal trade. The prices which government officials say they are considering implementing are expected to undercut the street price of marijuana in the capital city of Montevideo, but are only barely competitive with prices in the country’s interior (see this map of reported price variation of marijuana around the country). But if the drug is made available to users throughout the country, and is cheaper (or at least of better quality) than the marijuana sold on street corners, it could take a considerable bite out of the profits of criminal networks in the country. Officials say that Uruguay consumes around 30 tons of marijuana a year, generating between 30 and 40 million dollars a year in illicit revenue. The hope is that this will translate to a decrease in criminal activity. While it is one of the safest countries in Latin America, Uruguay’s crime rate has been rising in recent years, and 2012 was a record year for homicides. Police are also concerned about the emergence of increasingly organized criminal actors in the country. Although Uruguay’s underworld cannot be compared to those in Central America, Colombia or Mexico, authorities say there has been a rise of gang-like criminal bands in urban areas. By taking away their profits from marijuana sales, the government hopes to deny them the financial capability to expand into a bigger threat. El Espectador has an overview of the arguments presented at Colombia’s Constitutional Court hearing on the recently passed Legal Framework for Peace. While President Juan Manuel Santos argued that the legislation “does not amount to sacrificing justice for peace,” and Attorney General Eduardo Montealegre argued that it amounted to targeted prioritization of systematic human rights abuses, Inspector General Alejandro Ordoñez accused the government of “opening the door to impunity” for atrocities. According to Caracol Radio, the court has until August 20 to rule on the issue. See Reuters for English coverage of the hearing. Yet another report has linked the devastating cholera outbreak in Haiti to the arrival of United Nations peacekeeping forces in 2010. The Washington Post reports that a panel of independent experts commissioned by the UN to study the cause of the outbreak concluded that “the preponderance of the evidence and the weight of the circumstantial evidence does lead to the conclusion that personnel associated with the . . . MINUSTAH facility were the most likely source of introduction of cholera into Haiti.” This comes two years after the same commission concluded that the factors behind the outbreak were inconclusive, and that Haiti’s poor water and sanitation infrastructure contributed to the spread of the disease. As Peruvian President Ollanta Humala completes two years in office this week, La Republica reports that he appointed three new cabinet members: new Minister of Development and Social Inclusion, Foreign Trade and Tourism Minister and a new Culture Minister. According to the paper, the appointments make his cabinet practically evenly divided along gender lines, with nine women and ten men as his top ministers. The Associated Press features a profile of the victims of captured Zetas leader Miguel Angel Treviño Morales, who is believed to have masterminded a March 2011 mass killing of some 193 bus passengers and migrants in Mexico’s northern Tamaulipas state. Meanwhile, in the western state of Michoacan, police have been ambushed by gunmen eight times in the past three days, killing four officers and wounding at least 15. The Washington Post frames the rash of violence as a “sobering reminder” that the country’s drug war has multiple fronts. Although it was reported that the “Pact for Mexico,” the tri-partisan pact guiding the agenda of Mexico’s legislature, was still intact after post-election accusations of foul play against the ruling PRI party, it may be less stable than previously thought. According to El Informador, the head of the leftist PRD held a press conference yesterday and announced that it was not functioning, and had been “frozen.” “It's not working because you know very well were things that were injured in the electoral process of the elections on July 7,” the PRD leader said.